This section is from the book "Sewing - Handicraft For Girls", by Idabelle McGlauflin. Also available from Amazon: Sewing Handicraft For Girls. Under the heading "Textile Fibers and Fabrics," page 96, will be found subject matter which can be used in correlation with the geography, language and history work. The fifth grade subject is cotton. Many interesting collections can be made that will be instructive for the children. 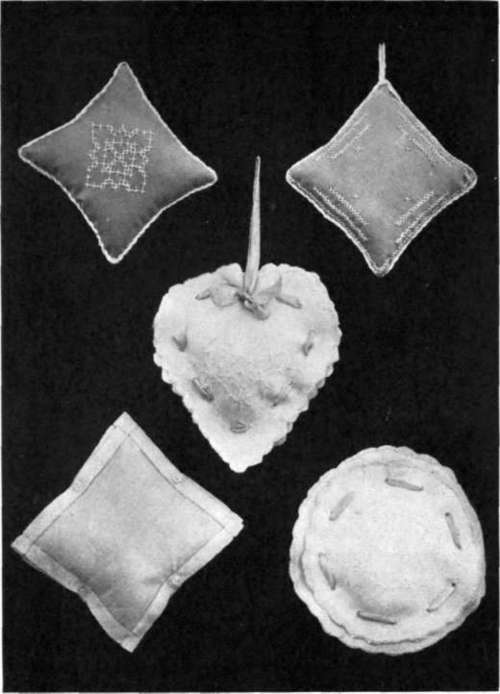 A Group Of Small Pin Cushions Illustrating Cross-Stitch Design, An Embroidered.